Another milestone in the house of Mahindra is its brand new Mahindra Quanto C6 which has been launched today and gained a lot of popularity. Media has covered a lot about it. But it seems like the car is liked by most of the people and can be summarized as Mini Xylo. The looks have been liked very much. The steel moldings at the sides adorn the car well. The wheel mounted on the tail gate doesn’t look odd at all. The grille is painted black and gives a ferocious look to the SUV. With Electric ORVM’s being body colored and body colored door handles and bumper, the exteriors nowhere leave the style. Interiors being very impulsive though soothing are noticeable by the people. The Digital Drive Assist System is assisted with topper pad. Some exclusive features include micro hybrid, roof console with sunglass holder and courtesy lamps. Utilities cover, bottle holders, magazine holders, mobile charging point, driver under seat storage, foldable snacks tray and utility box. These are equipped in the car keeping in mind the needs of occupants. Fabric upholstery with comfortable and adjustable seats even adds to it. 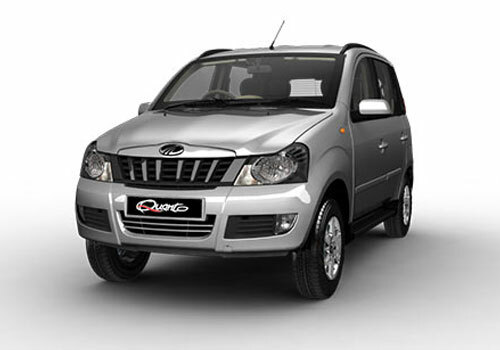 The comfort level of Mahindra Quanto C6 is increased with the spacious character of the car and the 7 seater capacity. The advanced stereo system with the AUX-IN, USB and Bluetooth connectivity mated with powerful AC are also the plus points which enhance the drive. The powerful diesel engine with 5 speed manual gear box, work of suspensions and brakes let the SUV churn out a great power and mileage up to 17Kmpl. The safety features of the car are very much advanced and these list the ABS, digital immobilizer, fog lamps, child lock and rear washer and wiper. These are just the introductory features and slowly the users can discover and reveal it.